EnCana is holding its analyst day this week, and the company's presentation is full of good information that I will mine for several posts in the next day or two. 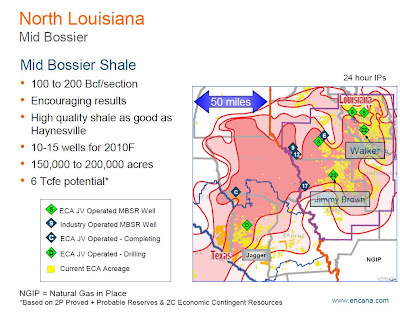 I'll start with the update on the Middle Bossier Shale. 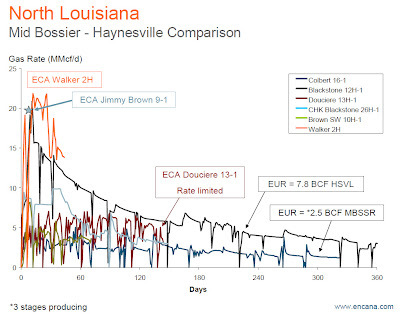 Recall that the Mid-Bossier is a few hundred feet shallower than the Haynesville Shale and overlays the Haynesville formation in the southern part of the play. EnCana was one of the first companies to publicize the Mid-Bossier and to date seems to have done the most work in the play. Most E&P companies with leases in the Haynesville/Mid-Bossier overlay are focusing on drilling the deeper Haynesville property to hold the acreage with an eye towards developing the Mid-Bossier at a later date. I view the Mid-Bossier as essential to EnCana's stock market value proposition. Since the company split into two with the high growth/higher risk E&P business staying EnCana and the slower growing businesses like oil sands and refining becoming Cenovus, EnCana is eager to boost the growth of the E&P business, with a goal of doubling the size of the company in a few years. To do that, it needs to make a stronger effort to prove and quantify the resource held in the Mid-Bossier Shale. Based on a few producing wells, EnCana is excited about the opportunity in the Mid-Bossier. 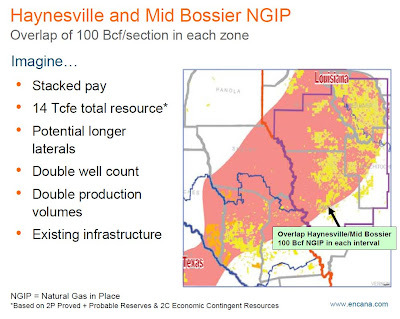 Here is a slide showing the overlap of the the core portions of the Mid-Bossier and Haynesville Shales (where 100+ Bcf is found in each zone) that is oozing with excitement because of EnCana's large leasehold in western Red River and northern Sabine Parishes. EnCana (and others) could realize significant cost savings through multi-well drilling from a single pad if it can access both the Mid-Bossier and Haynesville from a single pad. The company estimates that it holds 100 to 200 Bcf per section, compared to 175 to 225 Bcf per section for the Haynesville Shale. Well results have been strong, but production data has been inconsistent - mostly because there are so few data points - as shown on the type curves below. A number of people have asked me about how to spot Mid-Bossier wells. Unfortunately, it seems as though the best way is through anecdotal evidence from companies. As far as I can tell, there are about ten flowing Mid-Bossier wells. Below is EnCana's map, but it doesn't seem 100% complete. These wells will show up on the next detailed completions list, likely to be revised on Thursday.